WaveScan WaveFront aberrometric analysis system is a unique diagnostics device detecting all the imperfections and distortions (aberrations) of the visual system in case of both: low order (myopia, hyperopia and astigmatism) and higher order (coma, distortion, spheric aberrations). It is the presence/absence of such distortions that determines the qualitative features of human eyesight. In ideal visual system the light waves are not distorted, and parallel rays passing the eye optical system are focused in the same spot on the retina. The distorted visual system crooks light rays. This phenomenon is the background for the aberrometric analysis of the human visual system. During the aberrometric procedure a fixed wavelength light ray is directed inside the eye. It passes the cornea, the crystalline lens, the vitreous body, reaches the retina, and is reflected back. The aberrometer compares the initial and the reflected wave front and determines the difference (error). This wave front difference (error) describes the eye aberrations. One of the used principles here which is the analysis of the reflected ray (outgoing refraction aberrometry) has been first described in 1900 by Johannes Hartmann and modified in 1971 by Roland Shack, and was originally used in astronomy to compensate telescope aberrations caused by atmospheric and cosmic distortions. The idea to use wave front technology was developed in 1982 by J. Bille. In 1988-94 the aberrometric analysis for vision testing had been developed. This implied the wavefront reconstruction algorithm. In refractive surgery the Wavefront analyzer allows to measure the individual optic distortions (aberrations) 25 times more accurate than the standard methods, i.e. refractometer. Just recently the eye optics had been described using anamorphic (pherical and cylindrical) distortions which are lower order aberrations. Spherical distortions are: myopia and hyperopia, cylindrical are astigmatism. The rest of visual system optic defects were considered as “complex astigmatism”. The Wavefront analyzer, unlike a refractometer, measures all clinically relevant aberrations, higher order aberrations inclusive. These aberrations include according to ophthalmologists: coma, irregular astigmatism, high-order distortion and spherical aberration. The Wavefront is as individual as a fingerprint, each human has his own peculiar wavefront. The WaveScan System scans the eye to obtain the aberrations layout. The wave distortions are translated into the individual Acuity Map of the patient. The unique feature of the Acuity Map is not limited to registration of a refractive aspect of the eye (rather the corneal surface as in case of refractometers), but accurately presents the refractive status changes of the whole optical system (including parameters of the cornea, the crystalline lens, the vitreous body, tear film condition and all the visual apparatus chambers) basing on the wavefront distortions measurements. The Acuity Map shows in colour aberrations across the entire corneal surface. 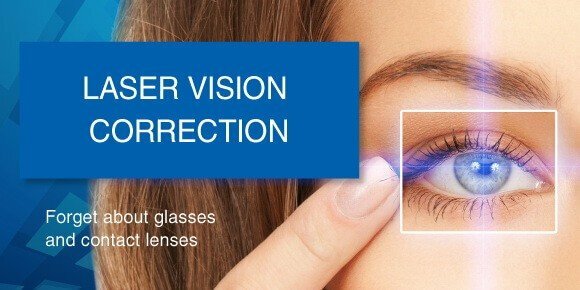 The WaveScan aberrometer is used in liaison with VISX Star S4 IR laser system which is used for Lasik Custom Vue (Super Lasik). The results of generated and reflected wave fronts (after it passes through all the eye media) analysis are evaluated. Then the special software models the shape of the corneal front surface that will fully and perfectly compensate the detected errors of the wavefronts (aberrations). This individualized data is recorded in the patient’s personal chart (special disk). This disk is input in the laser system for the laser correction, the data is used for the correction criteria calculation ensuring compensated corneal shape that would provide for the optimal vision with minimum aberrations (distortions). VISX Star 4S Lasik Custom Vue ensures high accuracy, stable outcomes and maximum reliability. The optical head projects a beam of rays on the retina. The rays are reflected by the retina and return to the wave device where they are registered by Hartmann-Schack sensors. The reflected beam reaches a matrix of lenslets and transferred to the camcorder. Each lens of the matrix collects photic information on deviations in different eye spots to form the light image that passes those spots. The sensor forms a pixel array. The device compares the pixel array positions to the theoretical ideal shape (ideal plane wave). In ideal plane waves each focusing point coincides with the lens optical axis and the received colour spots are equally distant from each other. In distorted waves the focus points shift in proportion to the local gradient causing asymmetric colour spots. The WaveScan System reproduces these focal points as templates for Hartmann-Shack sensor. The WaveScan software uses this data to calculate refractory errors and wave aberrations employing polynomial factorization method. The refractory errors and the wave aberrations are shown on the screen as the optical path difference between the changed reflected wave and the ideal plane wave. Using aberrometric analysis the WaveScan System modifies wave measurements into the Acuity Map which is a objective colour image of vision acuity variations across the whole pupil area. The Acuity Maps may be used to show all spherical, cylindrical and wave errors, higher order aberrations only, or the corigated by WaveScan vision acuity using adaptive optics. What can affect the wave analysis factors? Tear film abnormality. It can largely affect the wave analysis and topography, as well as other diagnostics. Even with normal cornea and other optical elements the uneven tear film causes serious wave aberrations. Opacity or noted aberrations. The wave registration systems cannot detect opacity however help to visually evaluate cataract and other crystalline lens changes. Besides there can be wave measurement difficulties caused by e.g. a cicatrix or a keratoconus. Myosis. Eyes with relatively narrow pupils can cause problems for the measurements and demand medicated dilation since the small pupil size does not allow to fully and properly carry out the wavefront analysis. Higher order aberrations are better seen with the pupil dilated.